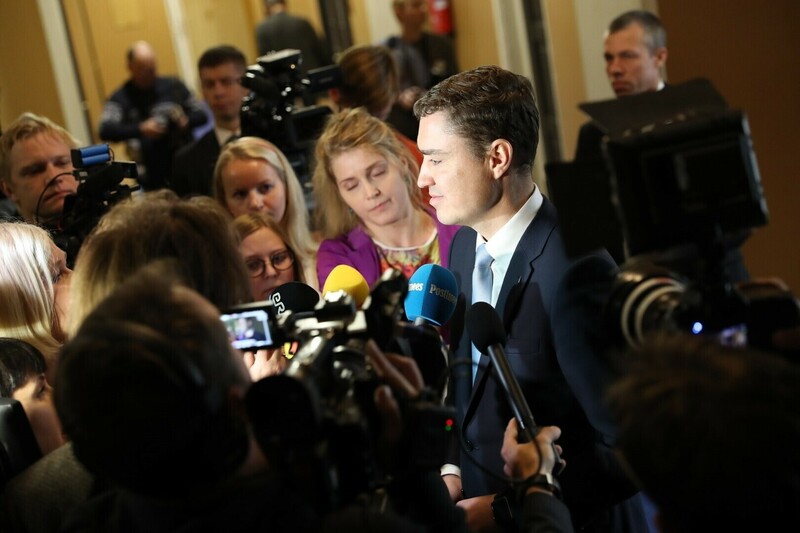 Prime Minister Taavi Rõivas (Reform) lost the vote of no cofidence against him on Wednesday and was forced to resign. The parties will now take up official coalition talks. President Kersti Kaljulaid has asked the party leaders to Kadriorg for individual meetings, to begin with the outgoing prime minister at 4 p.m.
Of the 91 members of the Riigikogu present, 63 voted in favor of removing the prime minister’s government, 28 against. There were no abstentions. Rõivas had refused to resign earlier this week, saying that his government had a democratic mandate, and would be removed by a democratic vote as well. He insisted on this course of action despite the fact that his government was de facto finished when on Monday evening, the Reform Party’s coalition partners, IRL and the Social Democrats, asked him to resign. In a statement before the vote, Rõivas insisted again that the upcoming change of government meant a move of the country to the left, like his party had been implying since Sunday. The Pro Patria and Res Publica Union (IRL), likely to take up negotiations with the Center Party and the Social Democrats to form a new coalition, was making serious concessions in terms of security, economic, citizenship, and educational policy, the prime minister said. In the questions following the political statement, Rõivas’ party colleagues gave him the chance to present his government’s work in a positive light before the Riigikogu one last time. Their questions elicited a list of achievements from the prime minister which, as he said, would be difficult to find in the work of any Estonian government that had been in office for just a year and a half. Rõivas said that he saw the accusations presented in the motion of no confidence as directed against the whole government, and not his own person, possibly with the exception of his reactions and rhetoric concerning the migration crisis. The rest of the accusations affected the coalition on the whole, he stressed. Chairman of the Free Party, Andres Herkel, said before the vote that the Reform Party had turned into an administration party that irresponsibly tried to hollow out the principle of a peaceful and democratic change of power with fear. “The Reform Party has developed into a typical administration party, like it has happened to a lot of parties in Eastern Europe and CIS states that have been in power for too long. Even United Russia and Yeni Azerbaijan are remote relatives, even though the Reform Party’s approach to maintain its power has been more refined,” Herkel said. The help of former Center Party chairman Edgar Savisaar in this had been “priceless”, Herkel said, quoting writer Andrus Kivirähk, who once called Savisaar the Reform Party’s best guarantee to stay in power, and its “honorary chairman”. They had been in power too long, Herkel pointed out. The Reform Party’s machine had busied itself with window-dressing and political technology, not substantial change. It was slowing down substantial reform, while its only strength was in creating brands and mythology. “The current talk of a move to the left can’t be taken seriously, just as the promise back in the day to make it into the five richest countries in Europe. Compared to their onetime ‘Citizens’ country manifesto', they have very much moved left themselves,” Herkel said, adding that apart from their tax dogmatism, there wasn’t much left of their political orientation to the right. The Riigikogu continued with the day's agenda after the vote. To journalists present, Rõivas said that he was proud of the 961 days he had been in office. President Kersti Kaljulaid met the leaders of the six parties in the Riigikogu one by one on Wednesday to discuss the situation. A first round of coalition talks between the Center Party, the Social Democrats (SDE) and IRL took place on Wednesday evening.